The elaboration of bells in the Prehispanic Era was of great importance due to the special meaning attributed to them in religious ceremonies. Today, knowledge of the techniques that were used in their fabrication is scant and lacking in detail. For that reason, the objective of the present study was to carry out a morphological study of bells from western Mexico that will serve as the basis for experimental projects in Prehispanic metalworking. Gold, silver and copper were the raw materials used in manufacturing bells. By utilizing the lost wax smelting technique, those metals could be employed in either their pure state or in different combinations. 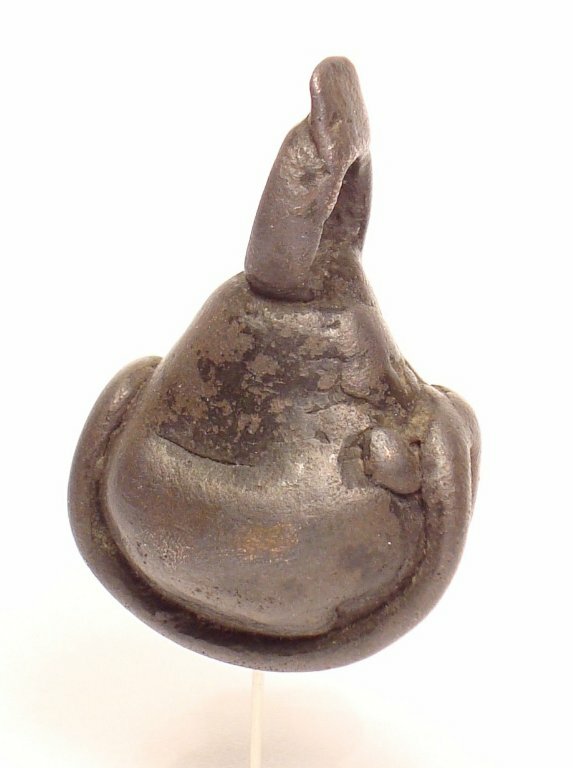 According to some studies, the smelting technique used in jewelry production emerged around the year 1000 B.C. in the area now occupied by the nations of Peru, Ecuador and Colombia. Later it spread to Mesoamerica between the years 600 to 800 A.D. through a network of commercial exchanges carried out by a whole series of indigenous peoples. The states of Guerrero, Michoacán, Jalisco, Colima and Nayarit in western Mexico contain the oldest metalworking sites discovered up to the present time (Hosler, 2002). Therefore, when jewelry manufacturing began in Prehispanic Mexico, it was able to take advantage of some 1500 years of accumulated knowledge, which led to it achieving its highest degree of technological development in Mesoamerica in approximately 1200 A.D. The lost wax technique employed in jewelry manufacturing is a complex process, one that requires concrete knowledge of the several stages or steps involved, including: 1. modeling the beeswax into the mold of the original design; 2. placing the smelting channels into the wax design; 3. mixing the clay, sand and charcoal to make the mold; 4. elaborating and smelting the metal alloys; and, 5. utilizing the tools and stones required to cut, polish and then apply the finish to the jewelry pieces. This process allowed its users to create more elaborate designs, compared to those produced using the hammering technique, the products of which are characterized by greater volume and a heavier texture. To read more about the distribution, meaning and production techniques of Prehispanic bells, the reader is encouraged to consult the following works: Carmona, 2003; Caso, 1969; Hosler, 2002; Long, 1964; Maldonado, 2005; and Ybarra, 2006, 2009. At present, the Florentine Codex (Códice Florentino) is the document that contains the greatest amount of information on how jewelry was fashioned in Prehispanic times. However, its descriptions lack the degree of technical detail and knowledge that would be required to accurately reproduce the processes that were used in that period (Sahagún, 1981). Clearly, the technological and artistic evolution of metallurgy in America, as well as the spiritual and religious symbolism attributed to its motifs, was characteristic of the continent's indigenous cultures, as they reflect no external influence from other places. This statement is based on studies of the interaction of metals during metallurgical processes, as well as on the uses and meanings of precious metals among cultures in both the Old and New Worlds (Patterson, 1971). Gold, silver and copper were the raw materials used in manufacturing bells. By utilizing the lost wax smelting technique, those metals could be employed in either their pure state or in different combinations. The yellow color of gold and the white color of silver had very deep religious and spiritual meanings among indigenous American communities, as they were related to the sun and the moon, respectively. For this reason, those particular metals came to be considered as sacred and, therefore, possessors of a special mystical value. For these reasons, any individual who came to wear adornments made of gold and silver acquired greater status, prestige and power (Aguilar, 1989). 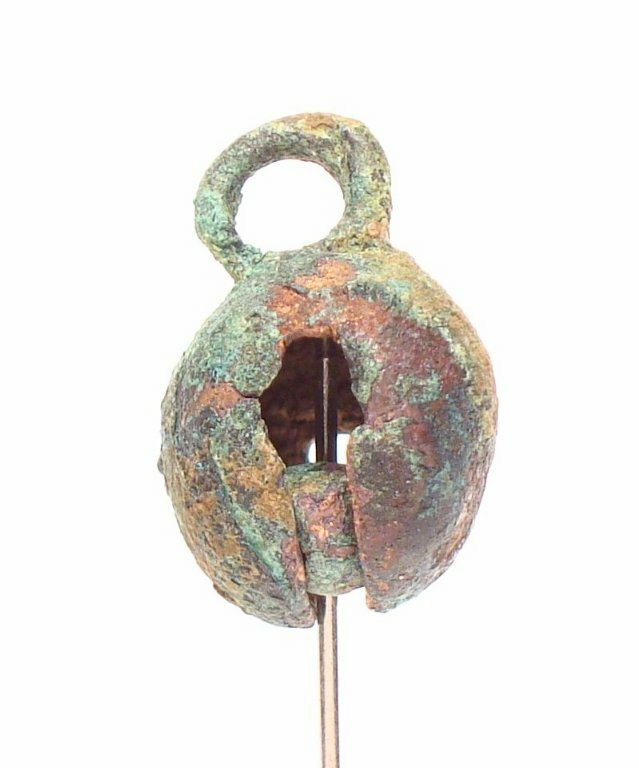 With respect to the Mesoamerican case, bells constitute one of the most abundant and ancient metalwork artifacts unearthed at archaeological sites, a fact that speaks to the importance that those pieces acquired in indigenous societies. 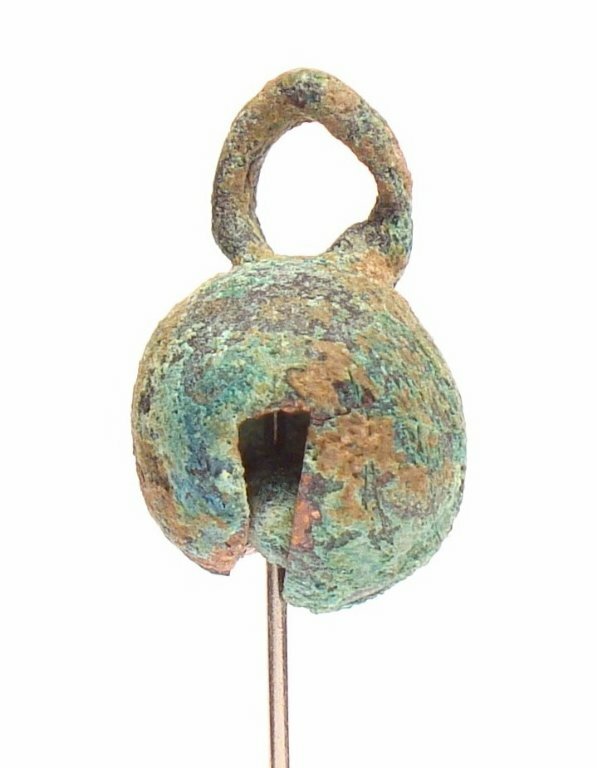 On the basis of archaeological discoveries and historical documents we now know that bells were utilized in religious ceremonies, rites and dances, and that their use was restricted to the society's dominant class. The sound that the bells produced was of great significance in ceremonies and rites in America, as the acoustic properties achieved by combining different metals seems to have been a matter of particular interest to many indigenous Mexican cultures. In some way, the clapping of the bells evoked the sounds produced by such natural phenomena as water, storms and rain, reason for which those objects eventually came to be associated with events involving fertility and nature's bounty (Hosler, 2002). 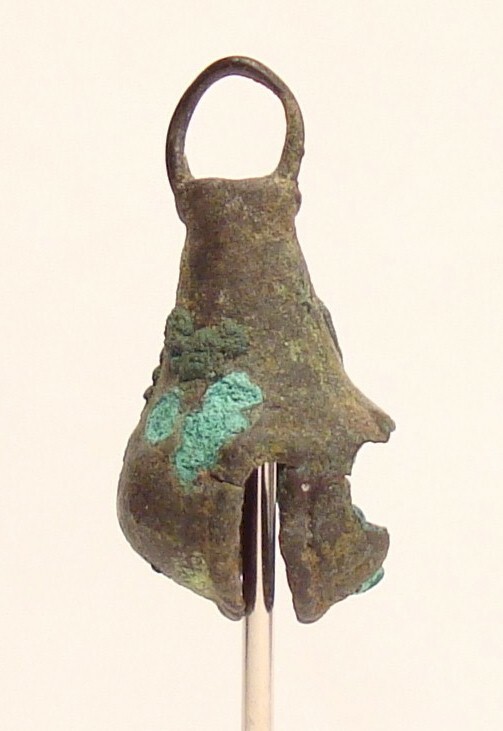 The objective of the present study was to carry out a morphological analysis of several Prehispanic bells that were discovered at a series of metallurgical sites located throughout western Mexico (in the modern-day states of Guerrero, Michoacán, Colima, Jalisco and Nayarit). The purpose of this examination was to establish the bases for experimental projects in the area of metalworking. 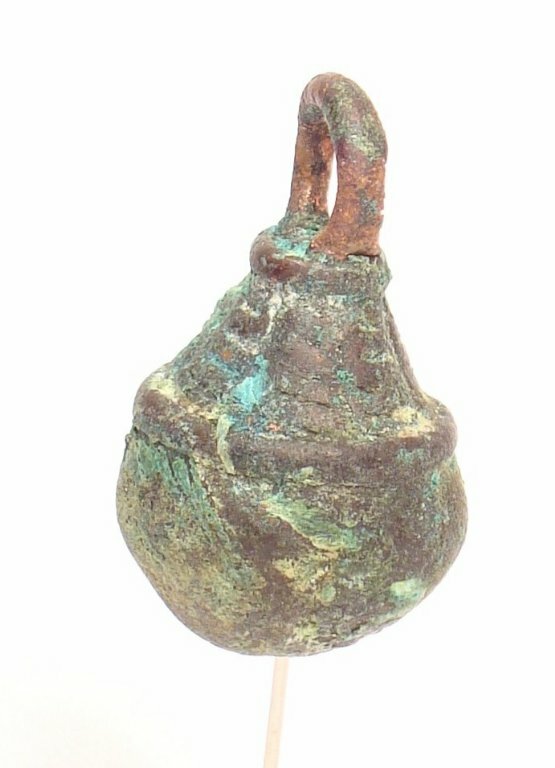 The characteristic of this kind of bell was that it was formed by placing cords or threads over the entire surface. These bells are lightweight and appear in a wide range of sizes. The method employed to produce this type of design consisted in winding fine cords of wax around a clay core. Then, during the smelting process, this texture was transformed into metal (Fig. 1, 2, 3, 9 and 11). This kind of bell is decorated using a wide variety of textures. Some designs manifest a "primitive" or minimalist appearance, as they are adorned with a thick cord around the piece's aperture. Other designs, in contrast, were found to have decoration in the upper part but a smooth texture on their lower section (Fig. 4, 5 and 15). 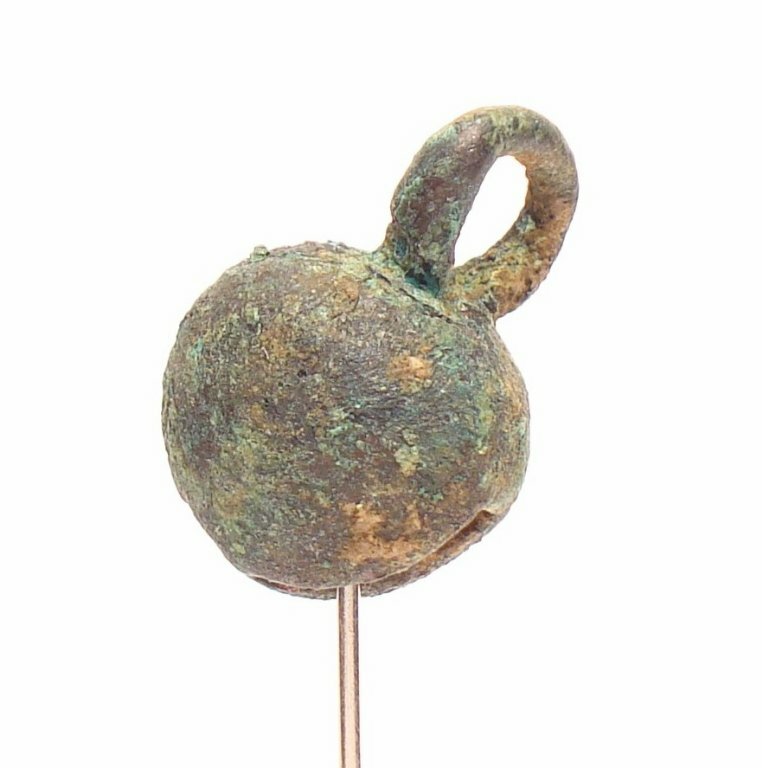 This type of bell shows no decoration at all, has a smooth outer surface, and is generally small in size (approximately 0.7 to 1.5 cm). These designs enjoyed a wide geographical distribution, as examples were found in all of the sites studied. Because of their size, it is probable that the function of these particular pieces was to form collars and bracelets (Fig. 6, 7, 8, 10, 12, 18, 19, 20, 21 and 22). It is important to point out that the thickness of the walls of all the bells examined was very thin, approximately 0.75 mm. This characteristic is important from the technical point of view as it suggests that those ancient metalworkers had developed the ability to adequately manage the temperatures of both the metal and the mold during the smelting process involved in elaborating complete pieces. 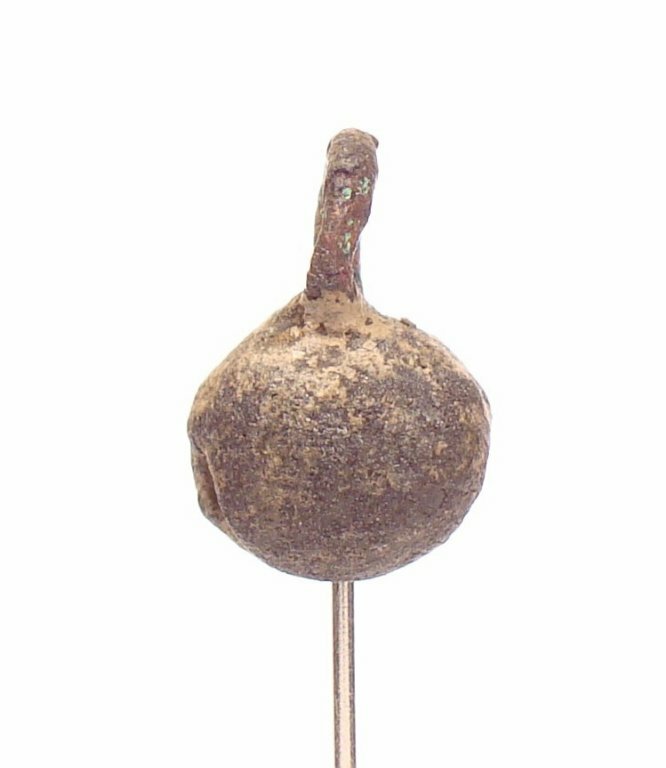 In addition, it is evident that the clapper of the bells (the part on the inside that produces the sound by hitting the walls) consisted of either small river pebbles or metal fragments (Fig. 8, 9, 10 and 12). 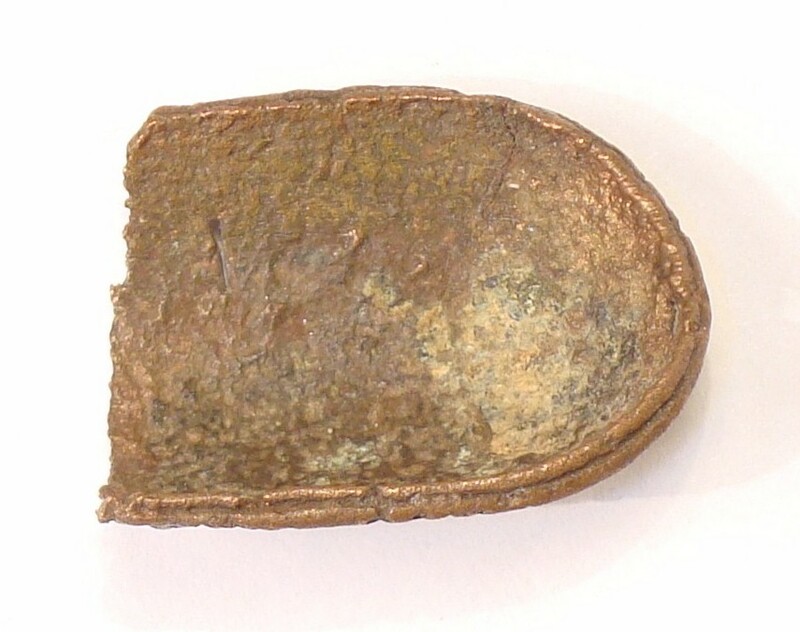 Two of the designs were found with perfectly circular metal clappers, a fact that indicates that those pieces were fashioned with great care and included the smelting of a fragment of metal of a known weight (Fig.10). In contrast, the larger bells have no clapper inside, a style that leads us to think that they were designed to produce sound when struck together; for example, as parts of collars (Fig. 1, 11 and 16). 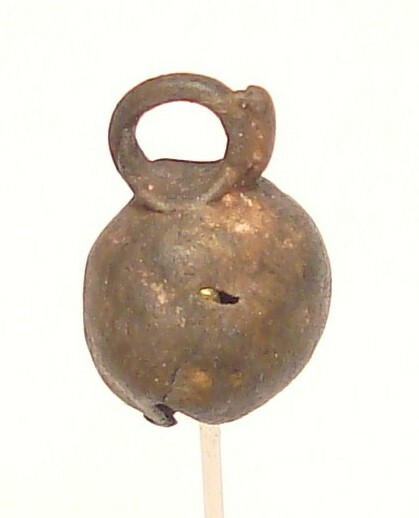 This type of bell shows a simple opening and was found primarily in the smaller designs, those less than 1 cm in diameter (Fig. 6, 7, 8, 10, 12, 19 and 21). This kind of bell presents a rim or lip that circles the entire opening. This design was found in practically all of the bells that were decorated with cord (thread or string). In this design, it was clear that the opening had been made by using a sharp instrument, and that the wax cord was then placed on the lip (Fig. 13, 14 and 22). This variety of bell has a decoration around the opening. These openings were classified according to the precise type of adornment they displayed: 1. Thick rim designs, where the decoration consists of a very thick lip or rim that is the focal point of the piece (Fig. 4 and 15); and, 2. Designs with braids: this adornment was achieved by intertwining two strands of wax, a technique that gave the completed piece a fine, delicate finish (Fig. 16 and 17). This feature of the bells focuses on the type of union through which the smelting channel was joined to the design of the rest of the bell. The objects were classified as follows: a Vanished union; b Spiral union; and, c Visible union. The smelting channel is the conduct into which the liquefied metal was poured so that it could flow into the interior of the mold during smelting. For this reason, the morphology of the union of this conduct and the bell itself is extremely important for determining some of the technical characteristics of the smelting process used in Prehispanic times. This union allows us to analyze the relationship between such traits as the width of the channel, the diameter of the suspension ring, and a piece's size and weight. It is important to note that signs of this union were found on the suspension rings of all the pieces. The following is a description of the three classifications of the union. 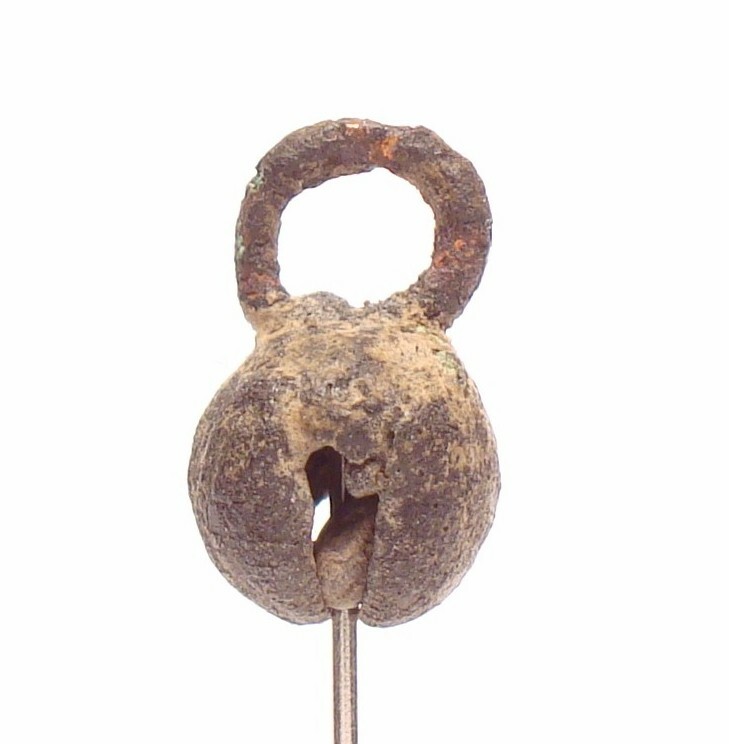 In this type of bell the suspension ring shows no obvious union with the smelting channel because the metalsmith took care to eliminate it by rubbing with grinding stones (Fig. 7, 8, 12 and 18). This kind of union was seen only in the bells elaborated with cords. One end of the suspension ring has a spiral shape that was simultaneously transformed into the smelting channel. Spiral-shaped suspension rings were found that consisted of one to three coils of wax cord. In several cases, one cord descended from the base of the suspension ring to the opening of the design. 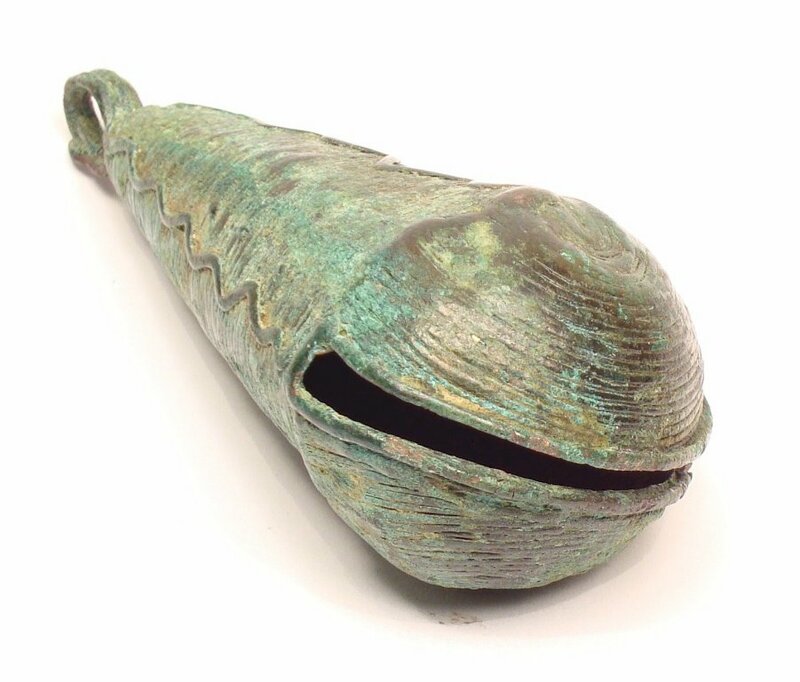 Clearly, it served two functions: it was both a decorative element and a secondary smelting channel that assured that the liquefied metal completely filled the inside of the mold (Fig. 1, 2, 3, 11 and 16). In these bells the suspension ring shows a visible union with the smelting channel, indicating that no care was taken to eliminate the conduct (Fig. 4, 16, 21 and 22). 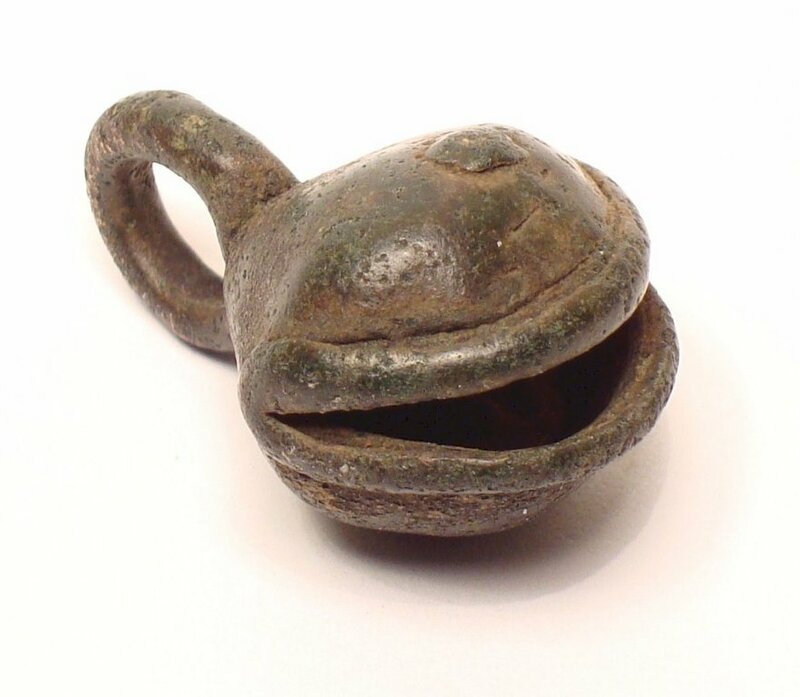 4a Small bells, measuring less than 1 cm and weighing approximately 1.7 g.
4b Medium-size bells; those that measured between 1 and 3 cm and weighed approximately 4.0 g.
4c Large bells that measured between 3 and 6 cm and weighed approximately 16.8 g.
Almost 90% of the bells fell into the small and medium categories. 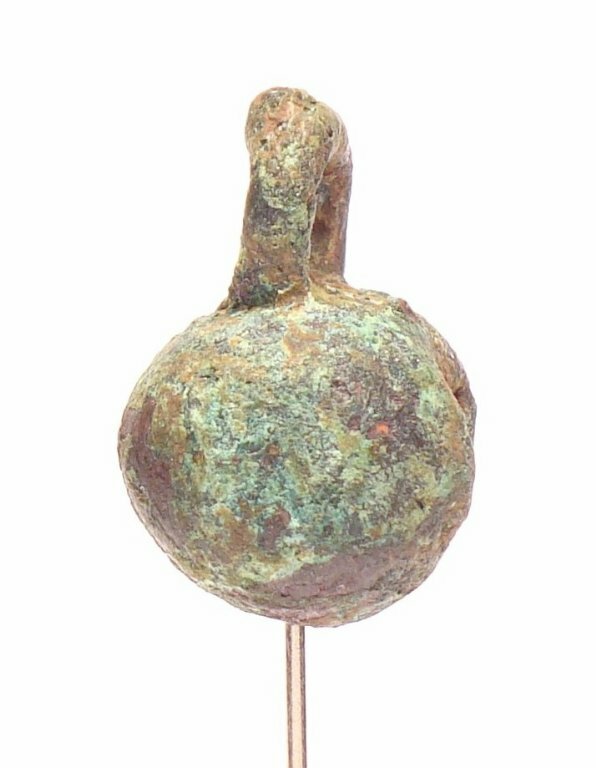 The smallest piece measured 0.65 cm and weighed 0.6 g, while the largest bell measured 5.64 cm and weighed 17 g (Fig. 1 and 12). Some of the morphological aspects of actual pre-Hispanic bells examined in this research provided invaluable information that was later used in our casting experiments, including, for example: the technique for modeling the wax strings, the size and location of the casting channel, the absence of ventilation ducts and the thickness of the designs. The description from the Florentine Codex (Códice Florentino), which is the most important historical document on this subject from the period, was used to set up the experimental workshop (Fig. 23). The test designs were elaborated in beeswax and white copal (vegetable resin). In the next step, they were covered with a mixture of charcoal dust and clay until they formed a mould. The metal (silver and/or bronze) was then cast by blowing air through wooden tubes (called cañutos), just as was performed in ancient times. From the 35 experimental castings, 26 complete bell designs were produced. One particularly significant finding was that the temperature of the mould was the most important factor that determined the successful elaboration of a design (Fig. 24 and 25). 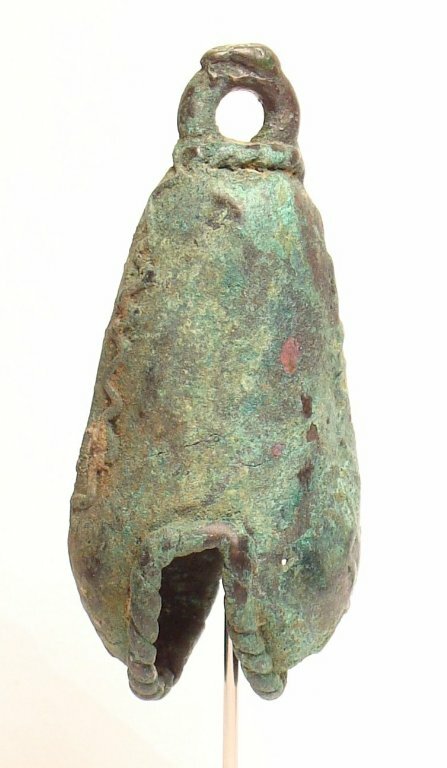 The morphological analysis of the bells, together with the description of the smelting process found in the Florentine Codex, are important sources of information that must be taken into account in the experimental archaeological work carried out to determine how jewelry was elaborated in Prehispanic times. Fig 1. Cord decorated bell. The spiral form of the suspension ring and the cord that descends from the base of that ring to the opening of the design are visible. This cord functioned as both a decorative element and a secondary smelting channel. Fig 2. Cord decorated bell. One can see the cord that descends from the base of the suspension ring to the opening of the design, and that functioned as both a decorative element and a secondary smelting channel. Also visible is the smooth face of the interior of the piece, evidence of the texture of the surface of the clay core upon which the bell was modeled. Fig 3. Cord decorated bell. The spiral form of the suspension ring and the cord that descends from the base of that ring to the bottom of the design are visible. 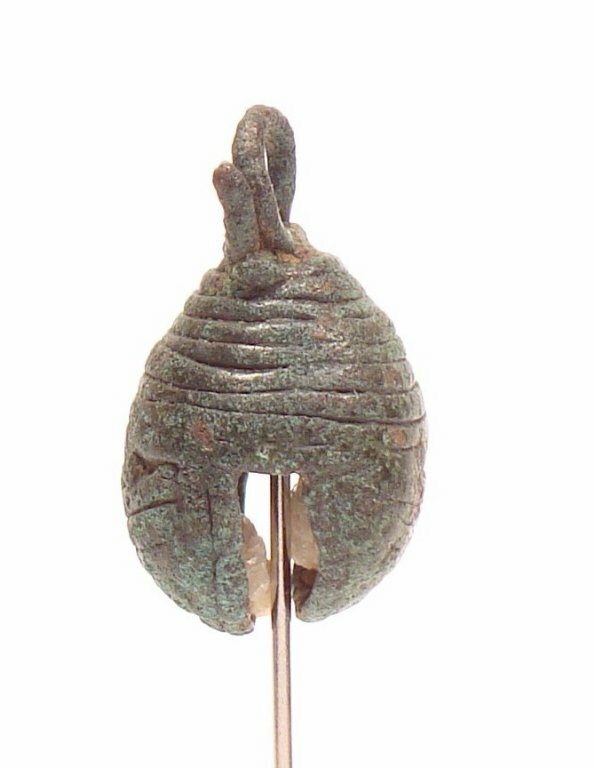 In addition to serving as a decorative element, this cord also functioned as a secondary smelting channel. In this image we see how the cords were interwoven to form the braided motif. Fig 4. Smooth surface bell formed by flattening the wax cords. Note the smelting conduct adhering to the suspension ring and a thick rim that decorates the opening of the design. Fig 5. Smooth surface bell; the upper part is made of sectioned wax cords, while the lower section has a smooth appearance. The suspension ring of this design shows no signs of the connection with the smelting channel. Fig 6. Smooth surface bell; the suspension ring of this design shows no signs of the connection with the smelting channel. Fig 7. 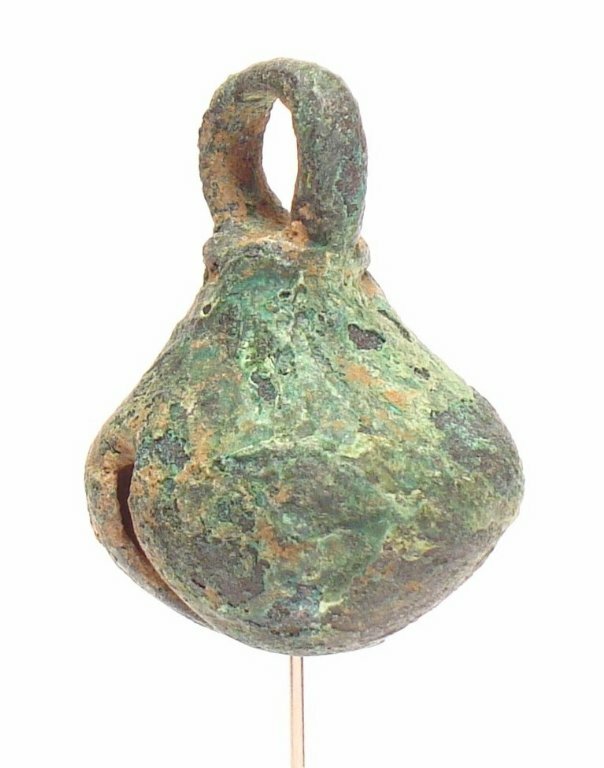 Smooth surface bell; the suspension ring of this design shows no signs of the connection with the smelting channel. Fig 8. Smooth surface bell. The suspension ring of this design shows no signs of the connection with the smelting channel, but there is a metal clapper in the interior. Fig 9. 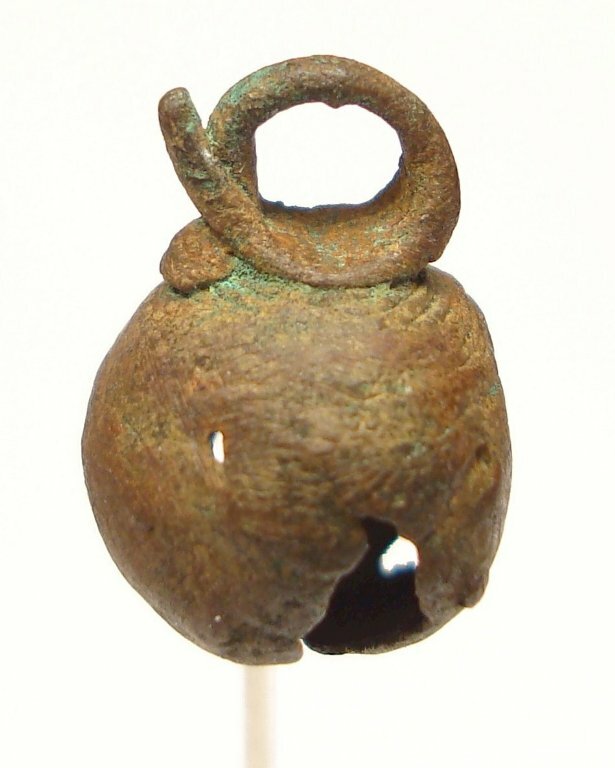 Cord decorated bell; the spiral-shaped suspension ring is visible, as are two stone clappers in the interior. Fig 10. Smooth surface bell; one can see a circular metal clapper in the interior. Fig 11. Cord decorated bell, but with no clapper inside. The visible cord that descends from the base of the suspension ring to the opening of the design functioned as both a decorative element and a secondary smelting channel. Fig 12. Smooth surface bell; the suspension ring of this design shows no signs of the connection with the smelting channel. Fig 13. 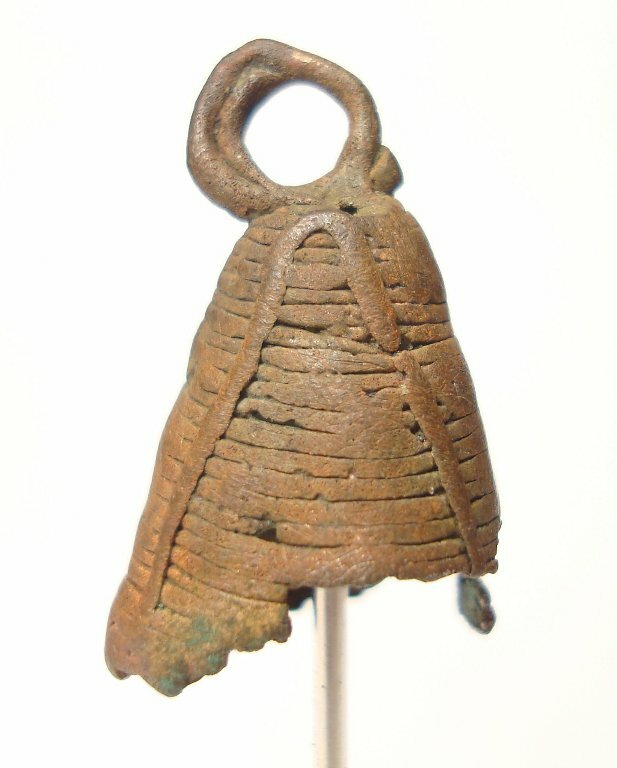 Fragment of a cord decorated bell; only the upper part of the design is visible. Fig 14. Cord decorated bell. 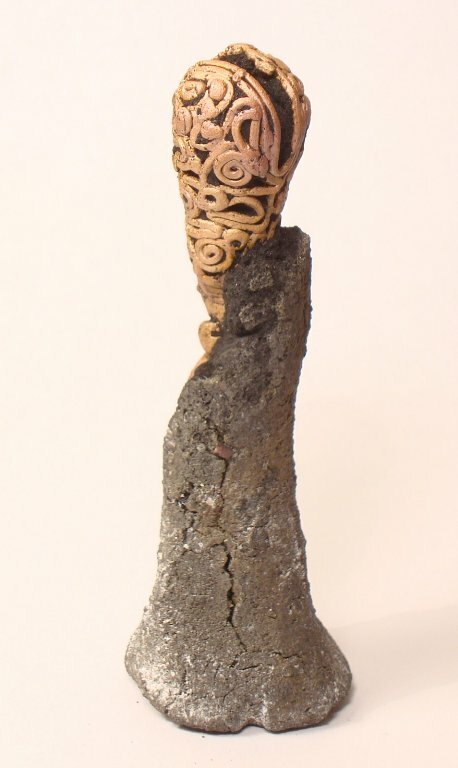 Note the interior part of the design and its smooth surface, showing the texture of the clay core used in modeling the piece. Fig 15. Prehispanic bell with a smooth surface that was formed by flattening the wax cords. Also visible is the thick rim that decorates the opening of the design. Fig 16. Smooth surface bell produced by flattening the cords of wax. Note the braided decoration on the opening of the design and the connection of the smelting channel with the suspension ring. This piece has a descending thread that goes from the base of the suspension ring to the opening of the design and that functioned as both a decorative element and a secondary smelting channel. Fig 17. 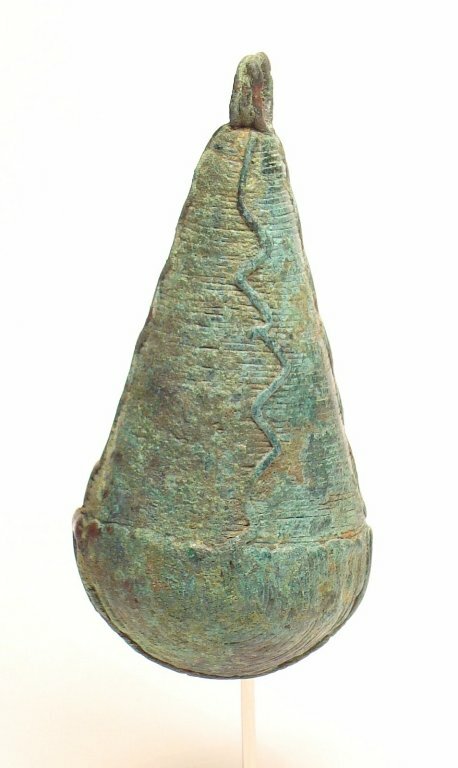 Smooth surface bell with a decoration in the form of a braid on the opening of the piece. Fig 18. 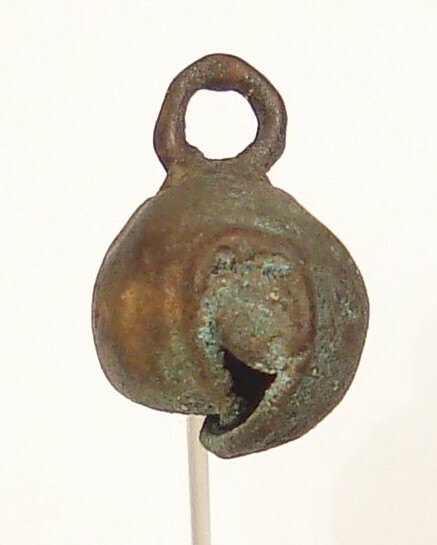 Smooth surface bell; the suspension ring of this design shows no signs of the connection with the smelting channel. Fig 19. Smooth surface bell formed by flattening the wax cords with a spiral-shaped suspension ring. Fig 20. Smooth surface bell and a spiral-shaped suspension ring. Fig 21. Smooth surface bell showing the connection of the suspension ring and the smelting channel. Fig 22. Smooth surface bell formed by flattening the wax cords. The suspension ring of this design shows the connection with the smelting channel. 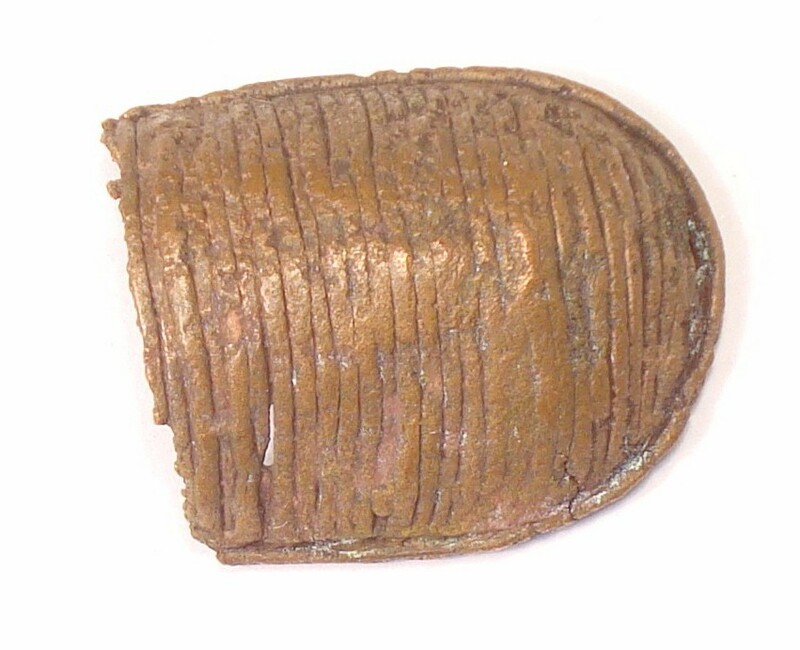 Also, there is evidence of a flaw in the smelting process that left one part of the opening filled with metal. Fig 23. 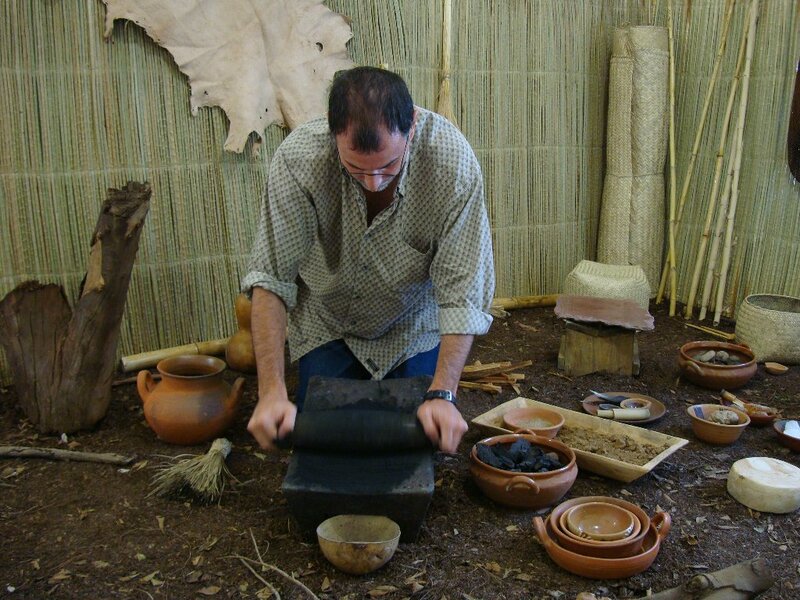 View of the experimental design based on information from the Códice Florentino; charcoal grinding using a stone metate. Fig 24. 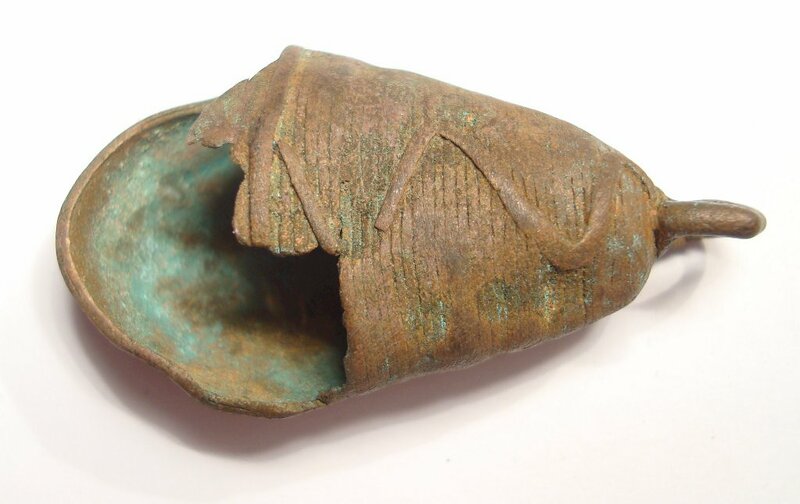 Example of an experimental bell cast in bronze. Fig 25. Example of an experimental bell cast in silver. AGUILAR, C., Orfebrería Prehispánica, vol. PhD, México, Editorial Patria, 1989. CARMONA, M., El trabajo del oro en Oaxaca Prehispánica, vol. PhD, México, Universidad Nacional Autónoma de México, 2003. The Sounds and Colors of Power: The Sacred Metallurgical Technology of Ancient West Mexico, Cambridge, MIT Press, pp. 320, 2002. LONG, S. V., "Cire perdue copper casting in pre-columbian Mexico: an experimental approach", American Antiquity, vol. 30, issue 2, Washington DC, Society for American Archaeology, pp. 189-192, 1965. PATTERSON, C., "Native Copper, Silver, and Gold Accessible to Early Metallurgists", American Antiquity, vol. 36, issue 3, Washington DC, Society for American Archaeology, pp. 286-321, 1971. SAHAGÚN, F. B., "Historia general de las cosas de la Nueva España", Editorial Porrúa, vol. 3, pp. 67-72, 1981. 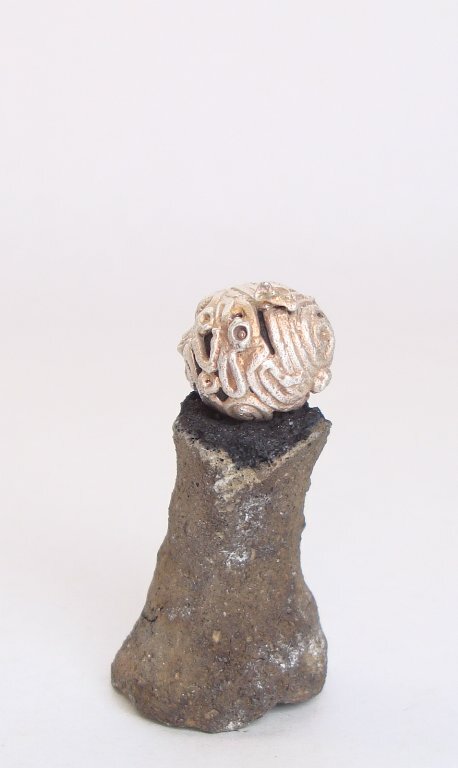 YBARRA, R., "Metalurgia Prehispánica: Técnicas de Joyería", IV Congreso Nacional de Metalurgia y Minerales, Coahuila, 2006. YBARRA, R., "Cascabeles Prehispánicos. Análisis Morfológico", Estudios Michoacanos XIII, Mexico, El Colegio de Michoacán, pp. 189-217, 2009.